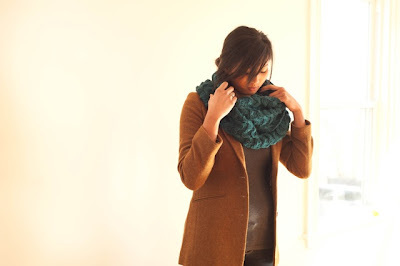 Susan B. Anderson: Ebb Cowl for Quince & Co.'s Scarves, Etc. 2013! Ebb Cowl for Quince & Co.'s Scarves, Etc. 2013! Excitement is running high over here surrounding my new cowl design, called Ebb, which is being previewed right now on Quince & Company's blog! Click here to see the preview. Today is just a short sneak peek, I'll have much more information and news coming up quickly. Click here for the Ravelry project page for Ebb! The Ebb Cowl (short for the expression, ebb and flow), is part of Quince's new ebook, Scarves, Etc. 2013. The ebook is being released next week on March 5th and the patterns are all being sold individually. That way you can pick and choose which patterns work for you. Scarves, Etc. 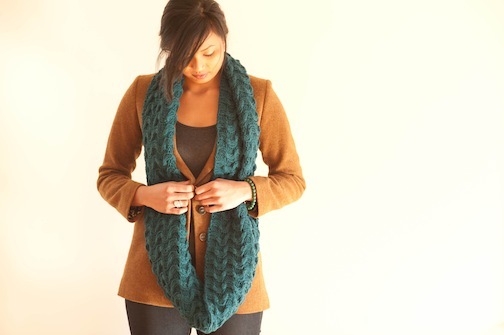 2013 has 17 new designs that include scarves, cowls, and shawls all designed by fabulous knitters. The collection started with an open call for submissions last fall. For reference, Ebb comes in four sizes, small, medium, large and extra-large. The sample above is the extra-large size and can be wrapped several times around your neck. The smallest fits up closer to the neck, once around. I am hosting a knitalong for Ebb starting on March 12th and ending April 12th, 2013. This will give everyone time to get their yarn and pattern together. You can join in anytime. I have posted an initial thread in my Ravelry group, Itty-Bitty Knits. Please let me know in the comments here and/or in the thread if you are interested in knitting Ebb along with me. I'll have many tips, sharing and prizes along the way! Click here for the Ebb Knitalong thread on my Ravelry group, Itty-Bitty Knits! I used Quince & Co. Lark in the Peacock (above) and Storm (below) colorways. Lark is a worsted weight yarn and is held doubled throughout the project. That means two-strands are held together while you are knitting. For naysayers on holding yarn doubled while you knit, it is actually fun and totally worthwhile! The finished cowl is unique, squishy and stunning due to the two-strands being held together. The cowl is also surprisingly simple and quick to knit. Ebb has a bouncy, plush fabric that shows the Ebb stitch pattern detail beautifully. You can sink you teeth into this rich cowl, dive in and stay awhile. It is the best! The gauge on the pattern is listed in the Ebb stitch pattern but if you are getting 3 stitches per inch in stockinette stitch you will be good to go. The stitch pattern looks deceptively difficult. It is mainly 2 by 2 rib with a fun twist every few rows. It is an interesting and captivating stitch pattern to work. Yarn Lark by Quince & Co. The photo above is of the first sample I knit of Ebb while it is drying on the blocking boards. Now you can clearly see why the name Ebb came to mind.... windy, back and forth, trails ebbing and flowing. The fabric is completely reversible, too, gorgeous on each side. There is much more to come! Let me know if you are interested in the knitalong. If you are not on Ravelry you can still easily participate in the knitalong by letting me know. I'll enter you in the giveaways and I will be posting on this blog to update everyone as we go. p.s. Quince & Co. is a dream yarn company. I have such respect for everything they do. What a privilege it is to have this opportunity with them. Thank you, Quince. Beautiful. Makes me want to sit down and knit it right away! I love how your pattern is for multiple sizes! This makes on pattern so much more accesible for different tastes and preferences. Love it! Love the cowl! I have a question for you regarding signature DP needles- What do you like knitting socks with 4" or 5 "
Interested in ordering my first pair! khfuller - i always order 6-inch for all of my dpns. it is the perfect length for me, not too short or long. i use the dpns for other things besides socks so i like to have a little extra room if i have more stitches and then the stitches stay on the needle, too. Your cowl caught my eye right away on the Quince site. I love cable-y details. I bet that would be nice for a Red Scarf scarf too, in worsted weight or even sport. I'm going to have to get the cowl as soon as the pattern is released. Where can we find Quince & Co. in/around Madison, Susie? Quince is found mainly online on their website. They do have a few stores that carry their yarns but none around here, unfortunately.